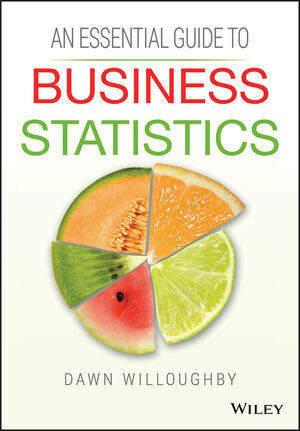 An Essential Guide to Business Statistics offers a clear and concise introduction for business students studying statistics for the first time. It helps them to become proficient in using statistical techniques and interpreting their results within a business content and will enable them to have a better understanding of customers, decision making and planning for the future. This is an ideal resource for undergraduate business students taking introductory modules in business statistics or quantitative methods. Accompanying the text is a rich supporting website which contains additional teaching and learning materials including slides for each chapter, tutorials in excel, self-test quizzes and student practice projects at varying difficulty levels. Dawn Willoughby is an award-winning writer and lecturer in statistics at the University of Reading, where she teaches students on a wide range of undergraduate programmes in areas including business management, statistics, mathematics, psychology, information systems and computer science. She is a qualified mathematics teacher with a degree in Statistics and Computer Science, and has achieved professional recognition as a Fellow of the Higher Education Academy, and is currently working on a Master’s degree in Education. A clear and concise writing style which is accessible to all students, including those who do not feel that numeracy is their strongest skill. A rich and comprehensive suite of practice exercises which enable the student to rigorously test their understanding of a topic; a full worked solution is also provided for each exercise. Screen shots and associated instructions are provided to explain how to use MS Excel to carry out many of the statistical techniques.